I am no chef. Just a mom that loves to cook for her family. And if there is one thing i do not believe in is that there is an ‘official’ version of a recipe. Each person can do according to their own taste, means, allergies and imagination. Oh and according to your time too, important factor in my house. I would like to share a recipe that is definitely not how Italians would do it and they would ‘boo’ me. I am okay with that and you know why? Because my kids and whomever tried it, loved it! I love the recipe because it is a different alternative to the usual pastas, rice and potatoes. Kids, toddlers and even husbands need to be seduced at the table. You can even prepare it with the kids, they’ll love it. Can be served with tomato sauce to dip in. 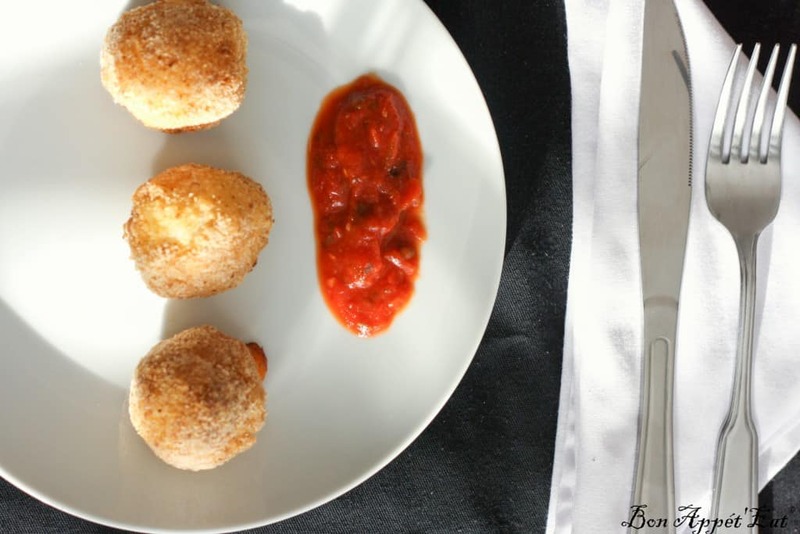 Instead of oven cooking, can be fried like the original italian recipe. The cheese can be substitute by anything you wish: ham, meat sauce… Let your imagination guide you! 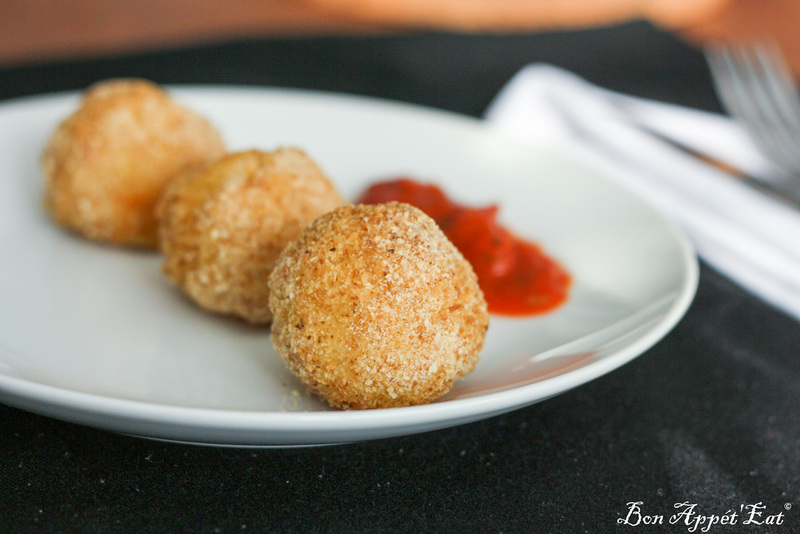 Generally, when i make this recipe, I make about 60 rice balls and freeze them uncooked. When I want some, I do not unfreeze them, I just throw them in the oven longer, about 25 minutes. Cook the rice in water (about double the volume of rice) with the herbs and salt to taste. Cook until it becomes sticky and there is almost no water left. In the meantime, in a deep plate, beat the 2 eggs, add some salt, and in another one, pour the bread crumbs. When the rice is cold, take some in your hand and make a ball. Push a hole with your thumb and put a cube of cheese in it and shape the ball with more rice if needed. The bite size, like a golf ball, is, to my opinion, the more convenient. If you wish you can make it bigger. Once all the balls are made, preheat the oven at 350°F and have an oven tray ready, preferably with parchemin paper. Take your rice balls one by one and roll them, first in the eggs and then in the crumbs. Place on the tray. Before putting in the oven, I like to put a drizzle of olive oil on them. Trilingual life and here is a Cuban flan recipe!